This past Sunday evening, like many Sunday evenings, we gathered with my sweetheart’s family for dinner. As per usual, the ritual was characterized by pizza and the exuberance of Ben’s five small nieces and nephews. There was a great deal of excitement: in the course of only a few hours, the baby rolled over for the first time, the eldest of the children demonstrated several new moves she learned at dance class, there was a lot of jumping and falling and a little bit of crying and fighting and I watched a strange video about Strawberry Shortcake and her friend Rapunzel-with-huge-purple-hair whilst snuggling with the little ones. I brought these granola bars for dessert. 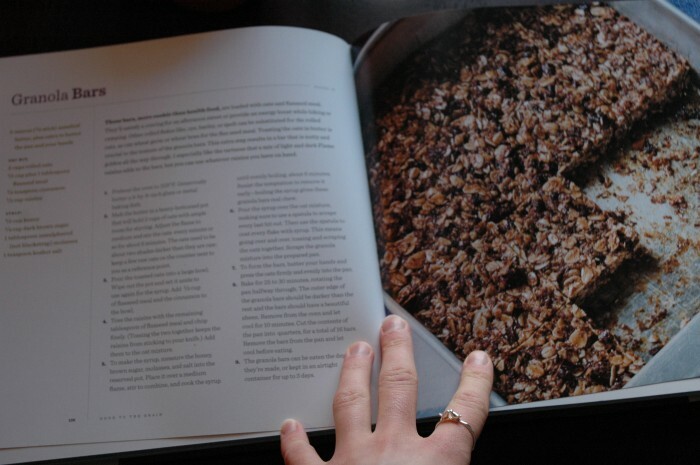 I have been meaning to make granola bars for some time now, in large part for Ben, who explains that he is always a little bit hungry. To me, this sounds equal parts awesome and awful. I mean, being hungry means that you get to eat, and that is one of the better things in this world. But when I think about never being quite satiated, I get rather depressed. Enter granola bars! They are filling, can be eaten on the go and are perfect for those moments when the stomach rumbles between meals. And if packed with oats and flax and fruits and good sugars, they are healthy, too–yet still fitting paired with tea for an afternoon treat, or with ice cream and coffee for dessert, as we had them on Sunday. 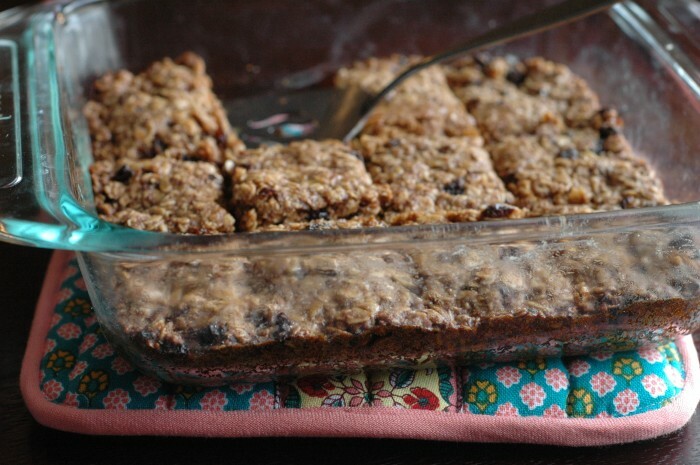 Most of all, however, an appropriately healthful and delicious granola bar will fortify you. It will empower you for such tasks as rolling over for the very first time or going without your pacifiers, if you happen to be zero-to-two years old. And if you’re a bit older than that, it will prepare you to sit through long meetings, stand on your feet all day, attend classes, run errands, bundle up to face the cold world or just get up in the morning when you’d rather stay in bed. So consider this your sparkly Disney princess temporary tattoo, and be fortified. I split the remaining bars with Ben, hoping for some fortification of my own for the week ahead. I don’t know about you, but I need that kind of strength. I got a shot at the doctor this morning, and clearly I am still a small child, because I decided that getting a scone from one of my favorite bakeries was integral to my recovery. Tomorrow will be a long day at work with a meeting immediately following…but I have granola bars. I am not afraid. I think these would be lovely with other dried fruits, such as cranberries, cherries, dates or apricots, or even a handful of chopped up chocolate or cocoa nibs. I advise you to pull the sugar mixture off of the stovetop quickly, and to bake these for just twenty-five minutes. I didn’t do either, and mine were a bit more chewy than I would have liked. If you get to these variations before I do, let me know your thoughts in the comments! Preheat the oven to 325 degrees. Butter an 8- or 9-inch square glass or metal baking dish. In a heavy, medium-sized pot, melt the butter. Add the oats, and over medium heat, toast them in the butter for 6-8 minutes, stirring every minute or so, until they are about two shades darker than they were when raw. Pour the toasted oats into a large bowl. Add 1/2 cup of the flaxseed meal and the cinnamon and mix gently. 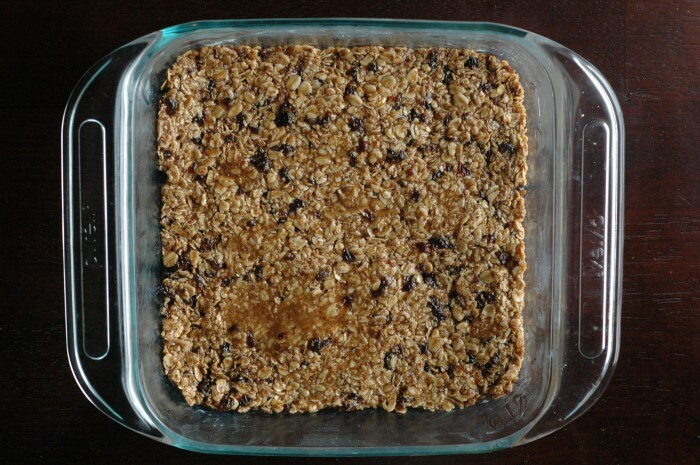 Wipe out the pot in which you toasted the oats and set it aside. 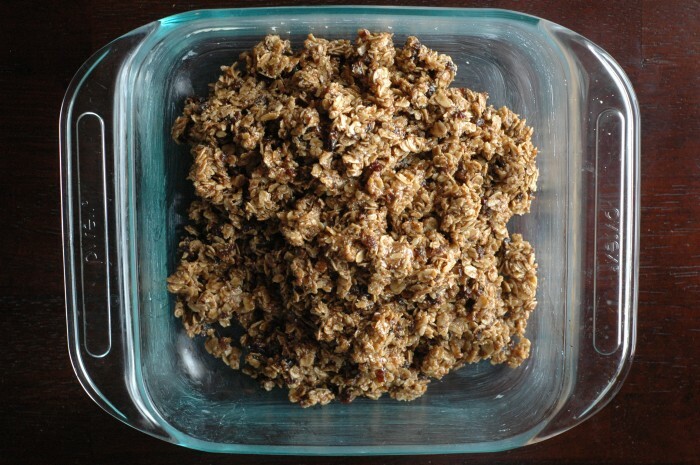 Toss the raisins (or other dried fruit) with the final tablespoon of flaxseed meal and chop them finely. Add them to the oat mixture. Combine the honey, brown sugar, molasses and salt in the pot and place it on the stovetop over medium heat. Cook until the syrup boils, about 6 minutes. Remove from the heat immediately; do not let it overcook. Pour the syrup over the oat mixture and mix with a spatula, making sure that everything becomes evenly and thoroughly coated. Scrape the mixture into the prepared pan and, with buttered hands, press it firmly to fill the pan evenly. 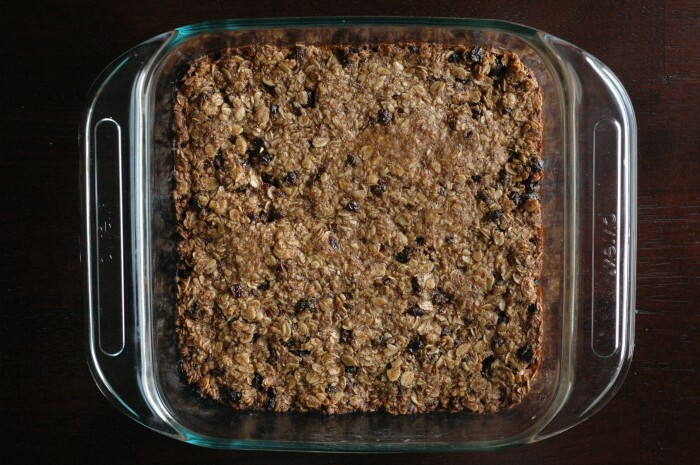 Bake the granola bars for 25 to 30 minutes, rotating the pan once at the halfway point. The finished granola bars will be shiny, and the outside edges will be darker than the middle. Remove the pan from the oven and let cool for 10 minutes. 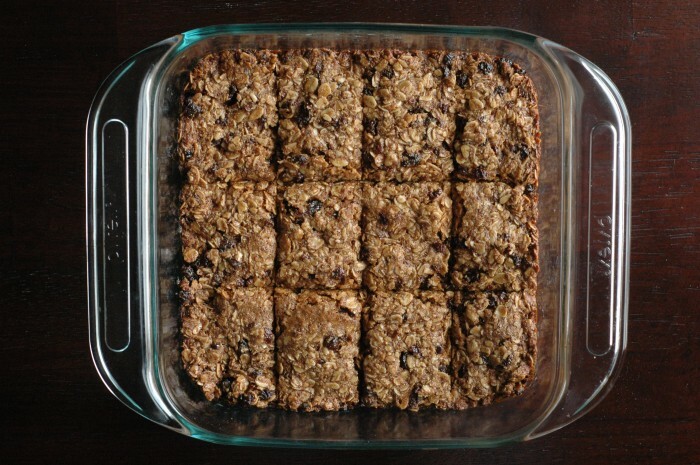 Cut the granola into bars, remove them from the pan and let them continue cooling. Eat immediately, or keep in an airtight container for up to 3 days. oooh YUM! 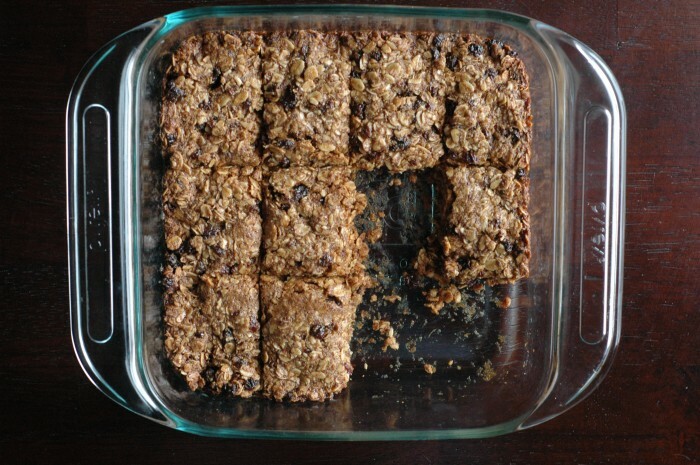 i’ve been wanting to make my own granola bars ever since a trip last year, and just haven’t found a good recipe. definitely going to try this! Ok, now I’m hungry. I think I may have to make these for Bible Study next week. Sound like your Sunday’s are full of fun. Keep sending the recipes. “I have granola bars…I am not afraid.” The motto of my comings and goings in this scary world. this is just excellent…and I can make it with gluten free oats :) haha iI will have to make these very soon! I have to mention that I was quite full that evening and couldn’t remember why…it was the bars! Thanks for sharing! i made these the other day to take along to a farming conference. they were so easy and delicious. i added prunes too! made these for the office yesterday, big hit! thanks for this healthy homemade goodness!